The Huskers put on a clinic, hitting .500 with just four attacking errors on 84 swings while holding the Bears to -.011 hitting. Nebraska’s 25-4 win in set three matched its most decisive win in the 25-point rally scoring era (2001-present). The Huskers also won 25-4 against Louisiana-Monroe in 2013. Set 1: Hames served the Huskers to a 4-0 lead to start the match, but the Bears answered with a 6-1 run to go up 6-5, thanks to consecutive service aces off the top of the net. Hames and Sweet posted back-to-back kills to regain a 12-10 lead for the Huskers. 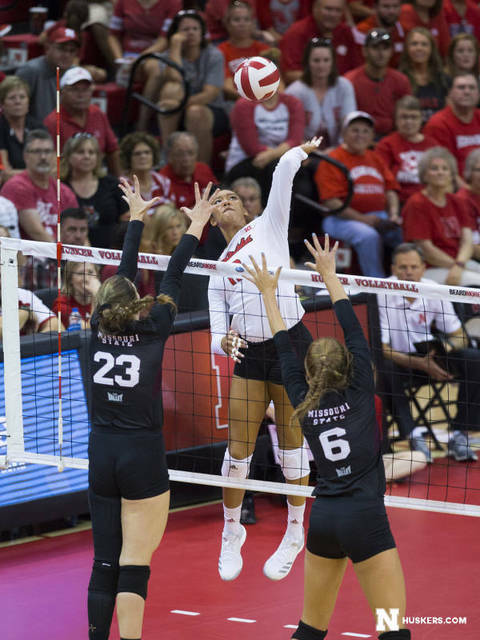 Stivrins terminated consecutive rallies to make it 19-16 Huskers, and the Huskers pulled away down the stretch for the 25-19 win with kills by Foecke and Sweet and a Foecke ace. The Huskers had a .419 to .083 advantage in hitting. Missouri State stayed close thanks to two more aces than the Big Red (3-1) and three fewer service errors (2-5). Set 2: The Huskers got off to another good start with Hames serving a 5-0 run. Schwarzenbach was in on two blocks, and Foecke and Sweet had kills. Foecke and Schwarzenbach then struck kills before Sun stuffed a Missouri State attack for an 8-2 Husker lead. Later in the set, Schwarzenbach and Foecke fired kills before a Hames ace made it 17-8 Huskers. Nebraska continued to pile on with consecutive kills by Sun, Stivrins and Foecke, helping the Huskers to a 25-12 win. Set 3: Nebraska’s strong starts continued as the Huskers opened up a 9-1 lead with Schwarzenbach posting four blocks and two kills. The Huskers were dominant from start to finish, closing the set at their biggest lead, 21 points. Nebraska had 16 kills on 23 swings (.696) and stuffed five Missouri State attacks. The Bears had three kills on 27 swings and hit -.148 in the set. Up Next: The Huskers begin Big Ten play at home against No. 19 Michigan on Friday. The match will begin at 8 p.m.